I love free-form tarts, both sweet and savory. 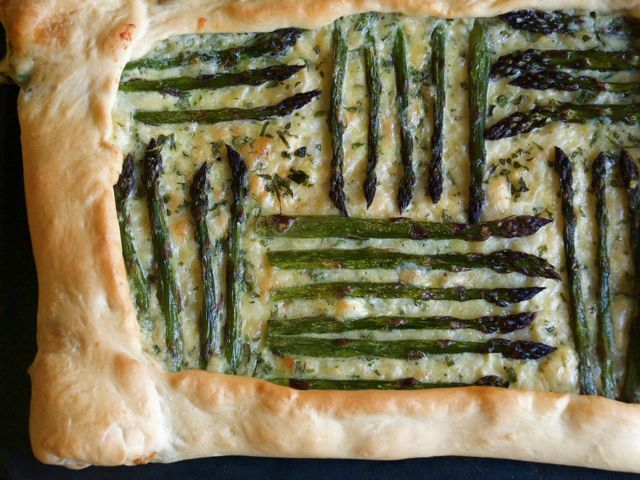 This recipe fills Deborah Madison's yeasted tart dough (in Vegetarian Cooking for Everyone) with a sprightly spring combo of goat cheese, tarragon, lemon zest, leeks, and roasted asparagus. Serve this for breakfast, lunch, or dinner, adding a green salad to round out an afternoon or evening meal. Prep the tart dough: In a medium bowl, dissolve the yeast and sugar in the warm water. Set aside for about 10 minutes, until bubbly. Add the olive oil, egg, and salt. Stir in the flour, ½ cup at a time, until the dough is too stiff to work with a spoon. Turn the dough out onto a floured surface and knead until smooth and elastic, 4 to 5 minutes. Add more flour if necessary to keep the dough from sticking. Set the dough in an oiled bowl, turn it over to coat all sides, cover with a dishtowel, and set aside in a warm place for 45 minutes to an hour, or until the dough has risen and doubled in bulk. Roast the asparagus: Preheat the oven to 425 degrees. Snap off the woody ends of the asparagus and trim the ends. Toss the asparagus with 1 tablespoon of olive oil and salt and pepper to taste, then spread the asparagus out on a large baking sheet. Roast the asparagus for 10 minutes, then remove the asparagus from the oven. Reduce the oven heat to 400 degrees. Make the filling: While the asparagus is roasting, cook the leeks in a large sauté pan over medium heat with 1 tablespoon butter and 1 tablespoon olive oil, a big pinch of salt, and a couple of grinds of black pepper. Cook for about 10 minutes, stirring often, until softened. Add ¼ cup of the cream, and continue cooking until only a little of the liquid remains. Remove from the heat and set aside. Crack the egg in a medium bowl and beat it lightly. Add the remaining ¼ cup of cream and the lemon zest, tarragon, and goat cheese. Stir until relatively smooth, then add the cooled leeks and stir until blended. Finish the tart dough: Line a large baking sheet with a silicone baking mat or parchment paper. On a lightly floured surface, roll out the dough into a large rectangle about 11 inches by 17 inches. Place the dough on the prepared baking sheet. Assemble the tart: Spread the leek-goat cheese filling thinly over the dough, leaving an inch-wide border along the edges. Arrange the roasted asparagus over the filling, in whatever decorative pattern you like. Fold the border of the dough over the edge of the filling. Bake the tart: Bake for 20 to 25 minutes, until the pastry is golden brown. If you like, you can brush the pastry edges with the 1 tablespoon of melted butter halfway through the cooking time. Serve hot or warm.